Residuum is a vignette series highlighting the aftermath of police killings through the experiences of the victims’ families. It serves as an extension of a larger project named the Forced Trajectory Project, both created by our communications fellow Nissa Tzun in Las Vegas, Nevada. Forced Trajectory Project is a long-term multimedia documentary project illuminating the narratives of families impacted by police violence. Utilizing still and moving images, sound and illustration, the project aims to serve as a storytelling platform for this most vulnerable and marginalized population. Despite the mainstream media attention excessive-use-of-force cases has received over the last several years, family and community voices are not uplifted and often overlooked, while the police department’s story is always the official narrative in a fatality involving themselves. The burden of investigating the victim’s death is often placed upon the family while dealing with the trauma of having lost someone in a violent manner. Forced Trajectory Project aims to investigate this social issue by listening to and archiving the experiences of families and communities directly impacted by it, recognizing the patterns that exist between each case in how police brutality narratives are constructed, and the family’s entrance into a very convoluted criminal justice system as they pursue truth and justice for their loved one. In the coming months we will be featuring the stories of victims Keith Childress, Jr., Tashii Brown, and Rex Wilson who were all killed by Las Vegas Metropolitan Police Department. This series will also explore solutions for a community left behind — including reforming the criminal justice system through voting in district attorneys who are fair about arrests and holding police accountable for their action. Nissa D. Tzun is a Center for Community Change communications fellow. 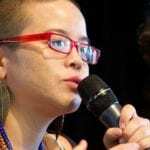 She is media artist, educator, community organizer, and the founder of the Forced Trajectory Project, an award-winning, long-term documentary project illuminating the narratives of families impacted by police murder, established in 2009. In 2014 she assisted in forming Families United 4 Justice, a nationwide collective of families impacted by police murder, organizing for collective and political power. Currently, Nissa works for the Journalism & Media Studies Department at UNLV, and is pursuing her Master’s in Social Work.